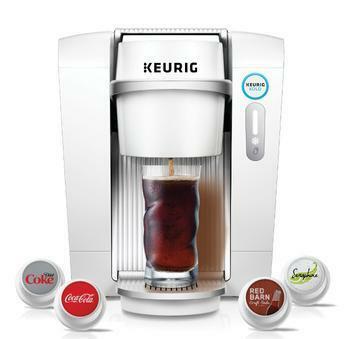 It sounded either brilliant or dumb, depending on your point of view -- Keurig Kold, a countertop machine that would make Coca-Cola, Dr. Pepper and other carbonated drinks in your home. The vote is in and consumers found it dumb. The $369 machine is being discontinued, along with the $1.25 pods that were needed to produce an eight-ounce cold drink, ice not included. Keurig Green Mountain conceded that sales never met expectations and the company, which was sold and taken private after the Kold roll-out, is stopping production of the devices, eliminating 130 jobs, mostly in Vermont. The Wall Street Journalreports today that the company is offering to buy back the machines from consumers, since the pods will not be available once the current supply runs out. Like Starbucks, which has expanded into tea, crumpets, and who knows what else, Keurig is apparently feeling that there's more to life than coffee. It has introduced soup, oatmeal, and various other pods that can be prepared in its machines. While making a cup of soup in a Keurig might have some appeal, assuming it didn't cost too much or take too much time, it may have been time and expense that froze out Kold. But spending $1.25 for an eight-ounce soda and then waiting 60 seconds for it to "brew" just doesn't have the same appeal as reaching into the refrigerator and grabbing a 12-ounce can of Coke that goes for about 41 cents when purchased in a 12-pack from Amazon. Kold isn't the only idea that's fallen flat at Keurig recently. Last year, the company backed off its plan to require that consumers use only "genuine" Keurig-licensed beverates in its machines.